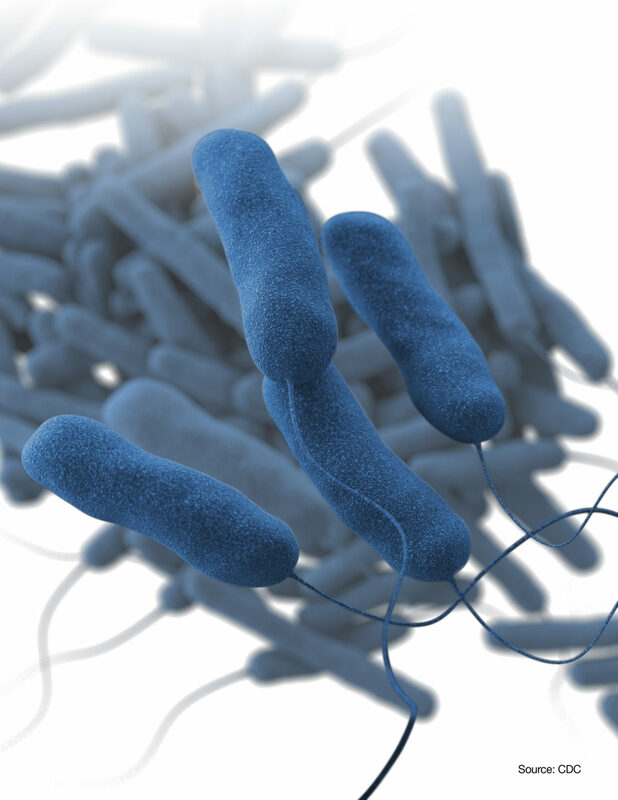 The New Hampshire Department of Health and Human Services’ Division of Public Health Services investigated an outbreak of Legionnaires’ disease, a potentially serious bacterial pneumonia, in Hampton, New Hampshire in 2018. The investigation identified at least 34 individuals with illness consistent with Legionnaires’ disease who likely acquired their infection from the hot tub or the potable water system at The Sands Resort in Hampton, NH between May and August of 2018. A total of 49 persons with confirmed, probable, or suspect legionellosis were identified during this investigation, including 20 meeting criteria for confirmed legionellosis, 14 meeting criteria for probable legionellosis, and 15 meeting criteria for suspect legionellosis. An additional 37 persons reporting possibly compatible illnesses were investigated, with 33 lacking enough information to assign a case classification based on the case definitions, three determined not to be cases of legionellosis, and one individual with confirmed legionellosis who denied vising Hampton, NH during the two weeks before becoming ill.
All 34 persons with confirmed or probable legionellosis exhibited symptoms consistent with Legionnaires’ disease (i.e. Legionella pneumonia). Among the 15 persons with suspect legionellosis, four exhibited symptoms consistent with Legionnaires’ disease and 11 exhibited symptoms consistent with Pontiac fever. Most persons with confirmed and probable legionellosis were hospitalized as a result of their illness and two died. Both individuals who died were adults, one over age 65 years, with laboratory-confirmed Legionnaire’s disease. Illness onset for all persons with confirmed, probable, or suspect legionellosis occurred between June 1st, 2018 and September 6th, 2018. Among all 49 persons with confirmed, probable, or suspect legionellosis, ages ranged from 3 to 88 years old and 24 (49%) were female. Most persons with confirmed, probable, or suspect legionellosis were visitors to Hampton, NH. Six (13%) were residents of NH; the majority were residents of Massachusetts. Through the course of patient interviews, two areas of possible exposure in Hampton Beach were identified: The Sands Resort and the L Street and M Street block of Ashworth Avenue and Ocean Boulevard. A total of 34 (69%) persons with confirmed, probable, or suspect legionellosis reported overnight stays at The Sands Resort in the 14 days prior to illness onset. Out of these 34 persons who stayed at The Sands Resort, 17 (52%) reported using the hot tub, 21 (64%) reported being in the hot tub room, and 24 (73%) reported taking a shower in a guest room. Fifteen persons (31%) did not stay at The Sands Resort, but reported other exposures to nearby areas including exposure to the L Street and M Street block of Ashworth Avenue and Ocean Boulevard. Among these 15 people, 11 (73%) reported walking by The Sands Resort or visiting a nearby establishment within a few blocks of The Sands Resort in the northern area of Ashworth Avenue; the remaining four individuals, including one who died, had incomplete interview information so their presence in this immediate vicinity is not known, though all were known to be within approximately 0.5 miles of The Sands Resort in the Ashworth Avenue/Ocean Boulevard area. Ashworth Avenue is a one way street heading south and Ocean Boulevard is one way heading north until Island Path, therefore it is common for people who drive in this area to loop around both roads in order to get to various locations in the area.